It did not help though. The keys in this one is broken too. The only difference between this one and the one in eBay with the one in eBay I managed to haggle and drop the price down by a lot. This one in the other hand the price is almost 200 dollars Canadian and there are no haggle to drop the price. I found an MSX 1 WAVY style 100% just like this one for 30 dollars (no joke) and it is working 100% no problem with it. 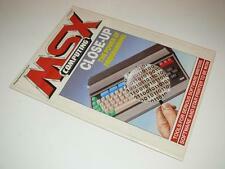 PROBLEM HOWEVER it is MSX 1 and not MSX 2 with vram of 16 KB only and 64 KB of RAM. Are there any cartridges that I can put in slot 2 of the cartridge that upgrades the RAM and VRAM and color capacity that can turn it from MSX 1 to MSX 2 with a simple cartridge? This way I can play MSX 2 on an MSX 1 via this expansion cartridge! Because if it is..then I will buy the the MSX 1 from eBay and in the future I will buy that cartridge as an expansion upgrade to turn it into MSX 2. Not only is this is fun for me..because I love MSX so much with the concept of expansion and revising like lego pieces...I take one part and modify it to another part all through cartridges but I love also love the concept of needing this cartridge or that to run games or apps. It really gets the geek out of me!! No. If you want an MSX2 you'll better buy an MSX2. 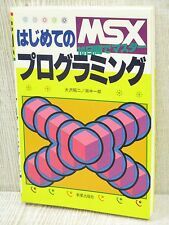 MSX1 to MSX2 cartridge do exist, but in practise it doesn't work well. Most of the software just use MSX1 VDP even if the conversion cart is present. In all fairness, what buyee.jp considers "junk" is highly subjective. I'm not advocating this particular item, but it seems like it's a common thing on yahoo auctions to label things as "junk" to avoid having the buyer return them for any reason. From my experience with "junk" from Buyee I learned that in the end it costs way more than it should and that the repairs are needed almost every time. One of the two Casio MSXs I had bought from them had a broken VDP and the stuck membrane, the other one had a stuck membrane as well. Definitely not worth 150 Euro that I had to pay for both including shipment and taxes. Not sure about computers (I certainly wouldn't risk buying a computer labeled as "junk"), but I've seen quite a few games labeled "junk" working and decent boxes and manuals. I got a copy of Quarth that's nicer than most I've seen around - also listed as junk. Then again, I also bought a Sony MSX on eBay that was supposed to be working that ended up severely damaged. But yeah, I guess it depends on the item and the seller. Few things to remember: Buyee (or jauce, or whiterabbit, or few others) is NOT an store. They sell themselves nothing. It's only a proxy service between Japanese marketplace (Auctions Yahoo Japan is the biggest to note here), seller using that marketplace and buyer. It's a common mishap to think that you're buying from "Buyee" or "Ebay", when you are actually not... The actual seller is completely other than the site in web. And sellers vary from individual persons to a small or relatively big shops. What comes to "junk" items: this is indeed used for removing the risk. There are also a lot of sellers who are selling all kind of stuff and do not actually have specific knowledge of the equipment (you can find for example someone offering one to a few MSX items and then rest of seller listings contains loads of various stuff from garage tools to kitchen equipment) -> junk treatment for an MSX item and that's easiest way to proceed. During past 20 years I personally have bought dozens of junk listed items, more than 90% of them did work straight away. But as said, nowadays the stuff is not as good anymore as in past, there has been a change even during last 5 years. The condition is weaker even when just looking on the pics in auction.